Oregon organic farmer David Brown didn’t start off growing 400-pound pumpkins, but every fall they hold a prominent place on Brown’s Mustard Seed Farms. Starting out as a 26-acre farm in Marion County, Oregon, Brown has grown his diverse, organic operation to 80-acres while also achieving large gains in soil health. “Our name, Mustard Seed Farms, comes from Scripture where faith is a grain of mustard seed that God will bless, and we will grow, and that’s exactly what’s happened,” Brown said. He’s grown the size of his farm and giant pumpkins by first growing the health of his soil. Brown gathers his strength from above – but does have some help from below from groups like USDA’s Natural Resources Conservation Service NRCS. Brown works closely with NRCS to implement numerous conservation practices that improve the soil health of his successful organic farming operation. In addition to pumpkins, Brown grows more than 50 other organic crops. To be USDA certified organic, farmers must adhere to standards which prohibit using chemical pesticides and herbicides. NRCS provides technical and financial assistance to growers who are certified as well as those transitioning to an organic operation. Organic farming refers to ecologically-based systems used to produce food and fiber. It relies on preventative practices for weed, insect, and disease problems, uses nontoxic methods to manage problems if they do occur and improves the natural resources of the farm, including soil and water quality. “When it comes to problems like weeds and pests, organic farmers have to focus on prevention and avoidance,” said Ben Bowell, a joint organic conservation specialist with NRCS and Oregon Tilth. To break the cycle of pests and weeds, Brown employs several strategies: crop rotation, mulching and cover crops. Crop rotation disrupts the reproductive cycle of insects. Pests adapted to eating one type of crop languish when that crop is taken out of rotation. Mulching and cover crops help to prevent weeds. Mulching covers the soil at the base of desired plants, preventing sunlight from reaching weeds. Cover crops overwhelm weeds. Densely planted, fast-growing cover crops, like rye grass get ahead of weeds, leaving them no room to grow. Organic matter is a hallmark of active, healthy soil. Improving soil organic matter is a central goal of organic farming. In fact, federal regulations governing organic farming explicitly promote soil health, stating the producer must maintain or improve the natural resources of the operation, including soil and water quality; and the producer must select and implement tillage and cultivation practices that maintain or improve the physical, chemical and biological condition of soil and minimize soil erosion. 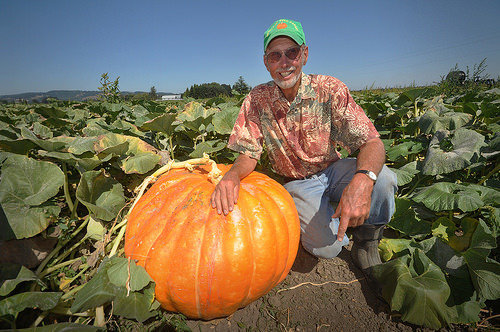 Read the full story via USDA Blog » Oregon Farmer Uses Conservation to Grow Farm, Giant Pumpkins.